It is a brave man who attempts to write a history of Meccano, the metal model engineering system that proved so simple but popular in its hey-day that its very name entered the English language to stand for any modular constructional system. Bravery is required because it is a hobby that has acquired an army of bolt-counting historians and restorers who love nothing better than to pore over a new variant part or an undiscovered de tail from the firm’s long history. Giants of the hobby like Bert Love, Jim Gamble and Geoff Wright have published definitive volumes about the hobby already, and the large and expensive New Cavendish series of volumes have surely detailed almost every aspect of Meccano’s life and products. 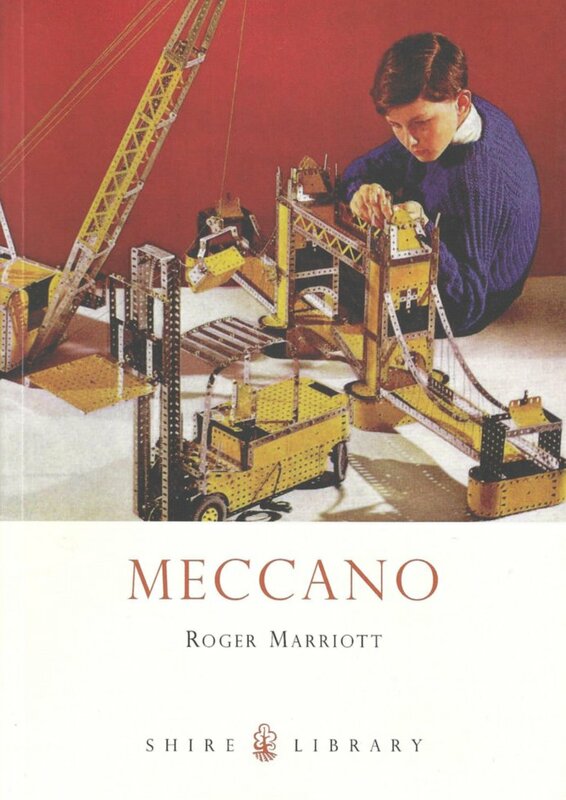 Strangely, though, there have been few affordable and accessible books about the history and development of Meccano for the casual reader, until now. Roger Marriott’s delightful little book came in under the radar as a surprise to many in the hobby and it has from its publication gained many appreciative comments from modern Meccanomen. Profusely illustrated it traces the history of the famous construction system from Frank Hornby’s first patent “Mechanics Made Easy” until 1979 when the Binns Road Factory closed in Liverpool. The last couple of pages underline the fact that while the UK factory may have died, the system is still very much alive, made in France and enthusiastically used and promoted by thousands of hobbyists around the world. Roger has worked closely with Jim Gamble (whose idea this book was) and others to produce a most rewarding book that opens up new delights with the turn of every page, bringing back a life-time’s memories. Any of the topics could be explored in greater depth and have been elsewhere, but as an introduction to the hobby and its history, or as an affordable souvenir of boy-hood memories fondly recalled, this would be hard to beat. This entry was posted in Uncategorized and tagged "Mechanics Made Easy", Binns Road, New Cavendish, Roger Marriott. Bookmark the permalink.